Dementia and How Saturated Fat is Good for You- Emily Deans, M.D. 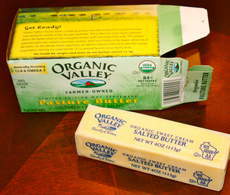 Don’t fear saturated fat; it’s good for you. Published on September 25, 2011- Psychology Today.com/blog by Emily Deans, M.D. I believe the hierarchy of medicine explains everything. Cardiologists had the EKG as soon as some poor soul was convinced to dunk his feet in (dilute) battery acid. Psychiatrists not only have no procedures (except shock therapy – a bit more controversial than a coronary bypass operation), we eschew modern medicine, often not wearing the normal white coat uniform, not even touching our patients. We just observe, and, horrors, listen. And, as we well know, insurance companies pay you to do things to your patients, not listen to them. Maybe cholesterol hates the heart (I doubt it), but it loves the brain. 25% of our body’s cholesterol is found in the brain, and synapses need cholesterol to do their whole “thinking” thing. Without cholesterol, or with a cholesterol level that is too low, our brains are toast. In addition to forming the synapse and being involved in key signaling processes, cholesterol is vital for the formation of myelin. Myelin is the insulation that keeps our wires from getting crossed in the nervous system. People with Alzheimer’s have decreased ability to make and repair damaged myelin. And so we come around to ApoE, an apolipoprotein, and the key to cholesterol in the brain. Apolipoproteins hang out on lipoproteins. You might be familiar with the lipoproteins, because they are famous as the “good” and “bad” cholesterol Low-density lipoprotein (LDL) is supposedly bad, whereas high-density lipoprotein (HDL) is fabulously good. 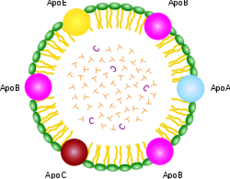 Lipoproteins have an important job – they carry fat and cholesterol through the blood and central nervous system. The picture is of a chylomicron, which transports dietary fat from the intestines to the liver. Chylomicrons are big and nonspecific. They have all the apolipoproteins hanging out on the surface so they can, eventually, become any kind of lipoprotein that is needed. Apolipoproteins (apoE, apoB, ApoC, etc.) are the keys to different areas of the body and to the different kinds of lipoprotein that carry cholesterol and fat around in the bloodstream. ApoE is the key to the brain. I mean that quite literally – ApoE is recognized by receptors so that ApoE-marked lipoproteins and their cholesterol and fat cargo are allowed into the brain. The kind of apolipoprotein E we have is determined by genetics. ApoE3 is the most common and is pretty neutral with respect to Alzheimers risk. ApoE4 is linked with a higher incidence of Alzheimers. ApoE2 is linked with a lower incidence of Alzheimers. It is thought that ApoE4 is an inefficient key – that ApoE4 is relatively poor (or inefficient) at letting cholesterol and fats get into the brain. Let me rephrase – Alzheimer’s disease is due in part to lack of the appropriate fat and cholesterol in the brain. There are peer reviewed studies proving my point from good journals (1)(2). Maybe it is a dirty secret, but cholesterol and lipids are actually way lower in the CSF of Alzheimer’s patients than in healthy controls (as low as 1/6th as much important brain fat as in controls). It is quite interesting that people with ApoE4 tend to have high levels of circulating cholesterol. Is this because they need higher blood cholesterol to transport dearly needed cholesterol into the brain? (3)(4). And what is beta amyloid, anyway? Turns out this pesky accumulating plaque protein actually seems to help the brain use pyruvate as fuel in lieu of glucose. ApoE can signal the brain to change from glucose as a primary fuel to fats (ketone bodies) and pyruvate. It is postulated this switch is caused when the brain is under microbial attack. In this theory, amyloid beta is not a cause of Alzheimer’s, but rather a defense against it. (5) . More evidence for this theory comes from a case study that MCT oil seemed to be protective or reverse symptoms of Alzheimers (6). There is also a theory that Alzheimer’s patients suffer from a poor ability to use glucose as fuel in the brain, so that a change to a ketogenic metabolism is exceptionally helpful (7). Increasing brain insulin and thus the utilization of glucose has also recently been proven to be helpful for Alzheimer’s in a pilot study (8). While these theories are speculative, at least they make biological sense. As opposed to the lipid hypothesis (or the diet-heart hypothesis), which suggests that animal foods we’ve been consuming as humans for millions of years is somehow bad for us, while the seed oils we’ve manufactured just in the last 50 years are somehow especially good for us. Our brains need cholesterol. Desperately. Don’t listen to anyone who would tell you otherwise. Emily Deans, M.D., is a board certified adult psychiatrist practicing in Massachusetts. She graduated from the University of Texas Southwestern Medical School in 2000 and from the Harvard Longwood Psychiatry Residency in 2004, and was a Chief Resident at Brigham and Women’s Hospital in Boston. She is currently a Clinical Instructor in Psychiatry at Harvard Medical school, though this blog has no affiliation with and does not necessarily reflect the opinions of the institution. The overarching theory she explores is that our bodies and brains do best in conditions for which they are evolved. She digs up scientific information and presents it in that context. She feels that by studying evolutionary medicine, we come closer to the answers for optimal conditions for health and vitality. Eat as much local, farmstand, grassfed, pastured, wild-caught as you care for. That’s vegetables, meat, fish, nuts, eggs, and fruits. In her opinion, if you have no serious medical conditions, it’s perfectly healthy to have high-fat dairy, safe starches such as white rice or potatoes, red wine, and dark chocolate in moderation. Also, get plenty of sleep and play. This blog is for the purposes of education – it is not to be mistaken for medical advice, and your health is in your hands. Only your personal physician can provide you with personalized medical advice suitable for you. Dr. Deans can’t practice medicine over the internet, so please don’t ask her to.